GMC’s 2019 Sierra pickup is a more-aggressive approach to design and engineering. The truck is scheduled to go on sale this fall, showcasing bold styling and innovative features that more clearly set it apart from its Chevrolet Silverado cousin. 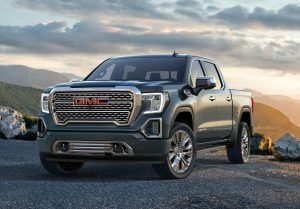 In the past, consumers wanted a more-conservative “truck driver’s truck,” but expectations have shifted upward, said Matt Noone, director of design, GMC exteriors. “They want a strong design that stands out on the street, which looks rugged and premium. A longer wheelbase and a shorter front overhang allowed front wheels to be moved forward to create new opportunities for cab and cargo-box design. The cab is larger and more spacious, providing nearly 3 extra inches of rear-seat legroom. The box is 7 inches wider than the current Sierra’s. GMC boasts it has best-in-class volume and the 63-cubic-foot short box offers more space than the competition’s standard box. 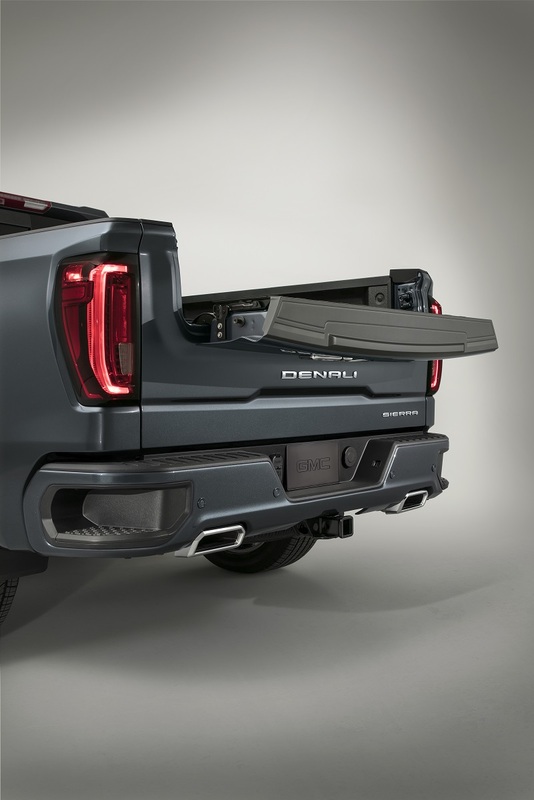 Three key design elements — at the front, sides and rear — are spotlighted in the 2019 Sierra. The main crowd-pleaser is a feature at the pickup’s rear. 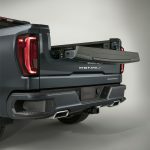 It’s a six-way-configurable MultiPro Tailgate, standard on Denali and SLT, which incorporates a clever folding inner gate. Basic MultiPro Tailgate configurations include: conventional lowered primary gate; lowered primary gate with vertical inner-gate load stop; lowered primary gate with dropped inner gate for easy access; closed primary gate with inner gate folded to create a standing work surface or second-tier load assist; closed primary gate with inner gate vertically positioned to create a second-tier load stop; and lowered primary gate with dropped inner gate folded to create a 375-pound-capacity step. Materials used inside of the cargo box also are on the Sierra’s list of upgrades. Use of a new alloy make it 50 percent stronger than the current box and, later in the model year, an industry-first carbon-fiber box will be an option. 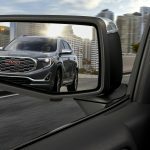 GMC reports the CarbonPro box has “unprecedented strength and durability,” and is dent, scratch and corrosion resistant. Using carbon fiber saves about 62 pounds compared to the steel version. Sierra’s design also makes a strong statement at the sides with distinctive sculpting. Noone traced an important new signature line that flows from the top of the taillamp, across the box and rear door, tapering down at mid front door and sharply diving near the door’s leading edge. The line continues about two-thirds down the truck’s side and returns to the rear. 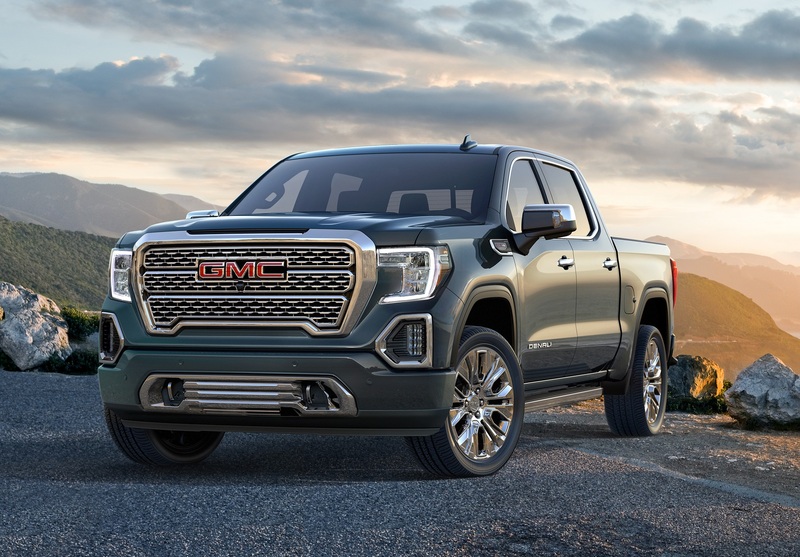 As expected of a GMC pickup, the Sierra and Denali grilles are bold, powerful and dominant. Fitting for what Noone labels the “most powerful Sierra Denali ever,” is a “distinctive, precise, dimensional grille design. 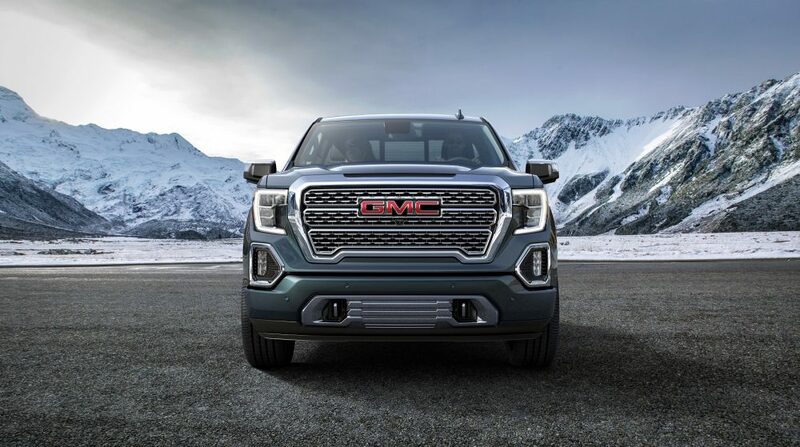 It’s detailed and sectioned to catch light and project a premium appearance that is unmistakably Denali.” The upright grilles blend with a taller hood and are flanked by headlamps with prominent C-shaped LED lighting. Under the hood sits new-for-2019 powerplants. Advanced versions of the 6.2-liter and 5.3-liter V-8s are offered, as well as a new 3.0-liter inline-six Duramax turbodiesel. The 6.2-liter and diesel are paired with an a new 10-speed automatic transmission. A Dynamic Fuel Management System on V-8 engines boosts efficiency with active cylinder management. It allows temporary deactivation of any number of cylinders in a variety of combinations. A segment-first Rear Camera Mirror is an option. 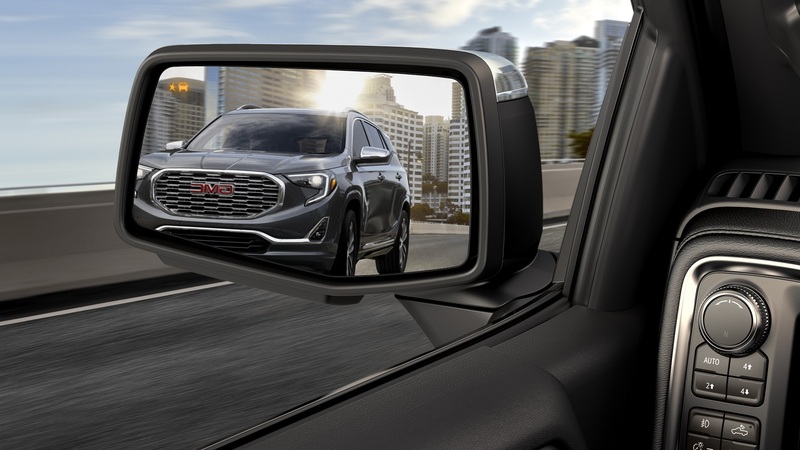 The dual-function interior mirror expands vision beyond common visual mirrors. It offers a high-resolution camera display and the ability to tilt or zoom the view. This entry was posted in Rely on the Auto Experts -- Motor Matters Reviews, Truck Talk. Bookmark the permalink.